In an environment where several software projects are running in parallel, it is necessary to standardise processes across different projects by implementing suitable tools. Fabasoft Scrum is the right tool to achieve this. Your scrum teams always have an overview of their backlogs, sprints, stories, tasks, impediments and defects. Working with the web browser client is very intuitive, making your introduction into the world of agile software development much easier. 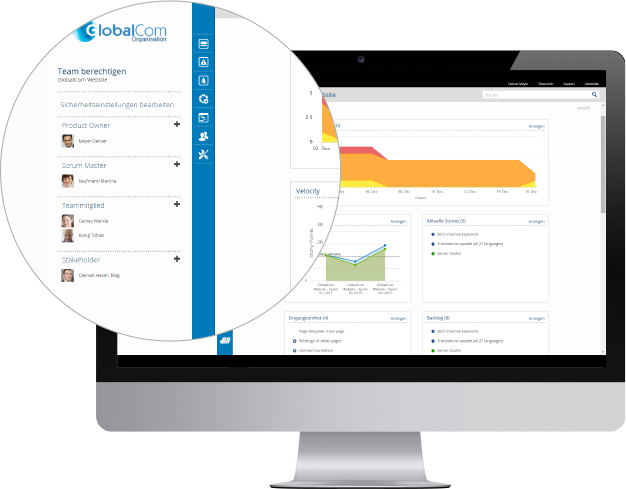 Each team member has his or her personal dashboard containing all relevant information. Thanks to the full-text search capabilities of Mindbreeze, your stories, defects, tasks and any further information are found quickly. The search is not limited to meta data, but also extends to the content of documents or annotations. Each user has his or her personal dashboard presenting the information relevant to the current tasks. Reports that have already been created (for example defect reports) can be accessed interactively via the dashboards. 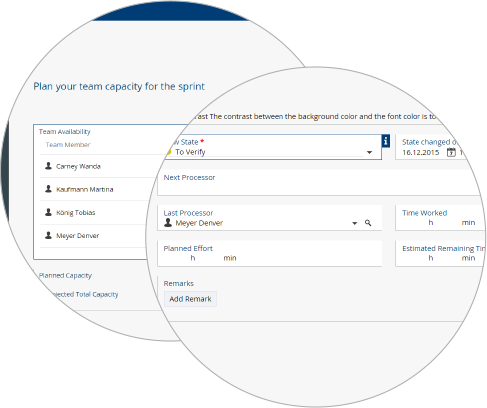 With the help of modern reporting options based on scrum-specific content and key figures, you always have an overview of the current status of your projects. Management reports can be sent as a PDF by email, for example. 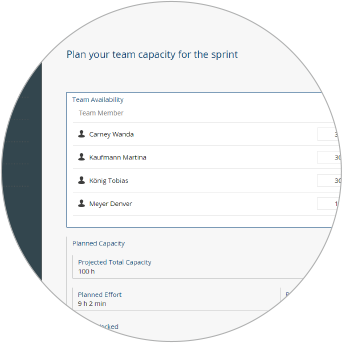 The integrated capacity planning functions as well as the possibilities for tracking already effected as well as still open time and effort form the basis of an efficient implementation of scrum teams as well as monitoring progress. Values entered on the level of a task are aggregated and can be viewed cumulatively, for example on the level of a story or a sprint. Mobile, decentralised and concurrent access to your scrum projects is made possible by an intuitive web browser client. 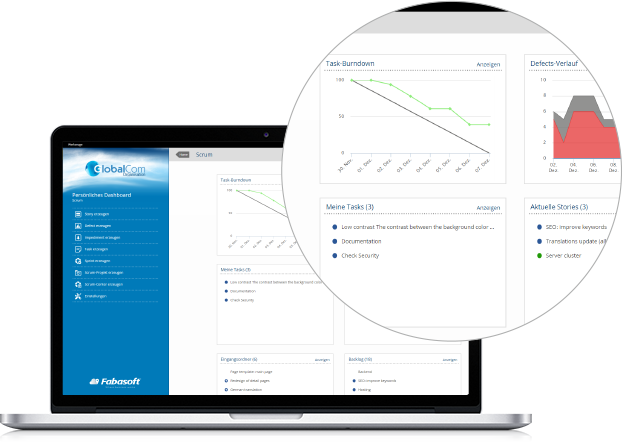 Fabasoft Scrum is available in 22 languages. The administration of access rights is easy and straightforward, and is based on scrum roles (product owner, scrum master, scrum team, stakeholder). Integrate internal and external stakeholders into your projects. Straightforward handling of change requests and quick processing of requirements. Coordinate the implementation of comprehensive features across several teams by putting the stories from the backlogs of different scrum projects into a relation with each other. One feature consists of many stories. Each story needs to be implemented before the next one, as it is the condition for the latter’s implementation. Make decisions and commit to delivery dates only on the basis of sound data, which is always available quickly and easily. 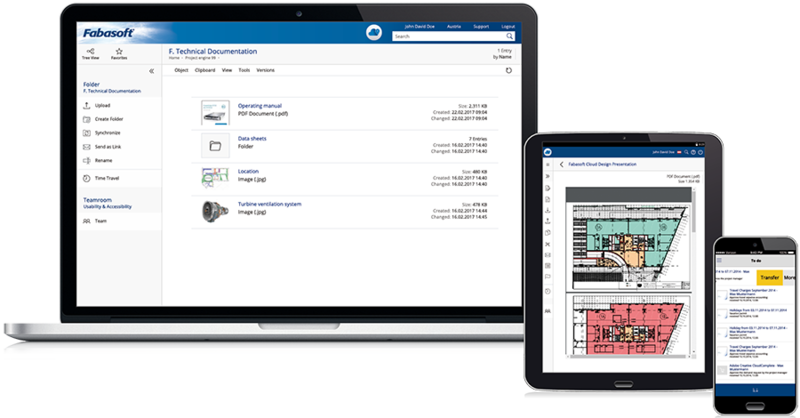 Full-scale integrated document management and digital asset management for your product design as well as your product and project documentation. Integration of external applications via standard interfaces such as web services (SOAP, JSON/REST). Out-of-the-box integration of Subversion to monitor check-ins and their reintegration into the branches.